are guarded by law and by SCIRP as a guardian. ity social integration is a process which has in its centre the individual and individualised agent. The ethnic picture in Europe is in a change. More and more people are moving to Western European societies. on education and job-situation and compare the relation between ethnic and local youth on these variables . minority youth not only meet reserved chairs but they also have problems for accessing the free chairs. nority youth and for knowledge about their own ind ividual agency. seen in a double perspective of “individualisation in biography” (Figure 1) . pean youth. Also inside Europe, of course, cultural differences are obvious. challenge and the organising of biography. coming an adult took place in everyday farming life under the lead of the adults. individuality phase was often taken care of by teachers. tional institutions but in many different social con texts. Ind ividua l learn ing trajectories are becoming life long. individual life style choice much more than a social and structural con s truction . comes from the modern society model. “prolonged youth time” model is the model of the late modern society. the changes along the two dimensions of individualisation and biography. 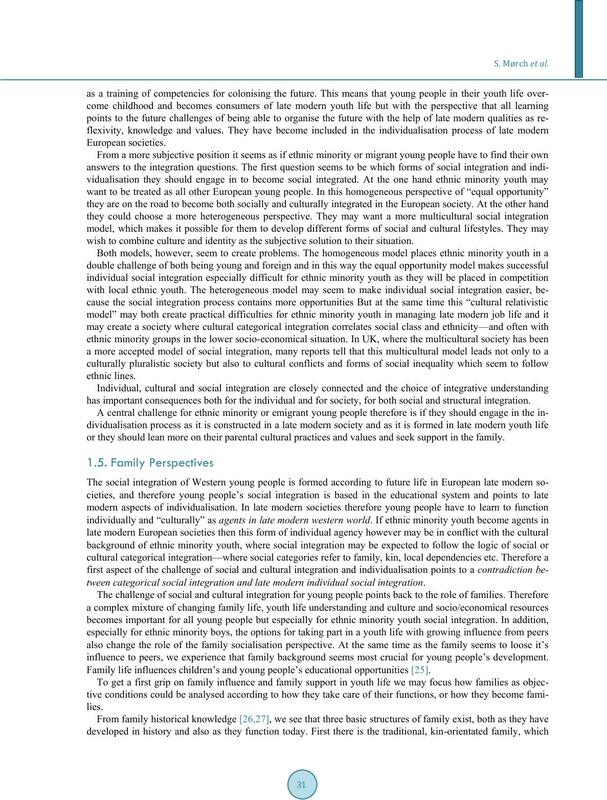 family life, and here especially for migrant ethnic minority youth. 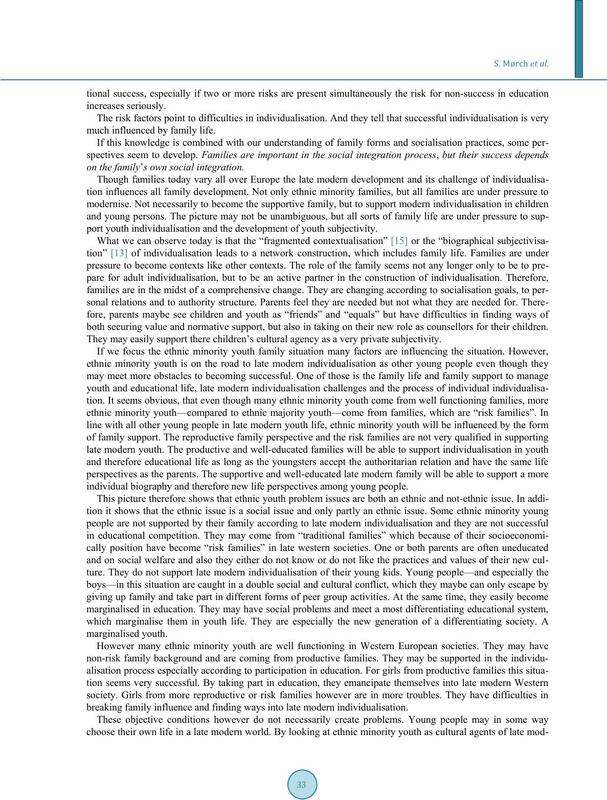 standing of the forms of late modern challenges of individualisation and family support in youth life. Figure 1. Youth theoretical dimensions. tion” have become more important but also much more an individual challenge and choice than b ef ore .
graphical subjectivation pro cess, as it is called by Leccardi [7,13, 14]. tion proce s s (modus 2) . “child-view” or child-understandi ng in late modern Wes t e rn world . ety support the individual in becoming “societal” . modern society to the late modern society. world, the new individualisation demands are often difficult, challenging, and contrasting [7,9-11]. and looks and not very often for educ a t ion and compete nc ies. popularity of youth life has invaded both childhood and adult life making both more or less disappearing [16,17 ]. tion phase youth has become more and more sought after. crimination in their everyday lives, they try to find other social contexts and societal opportunities in society. 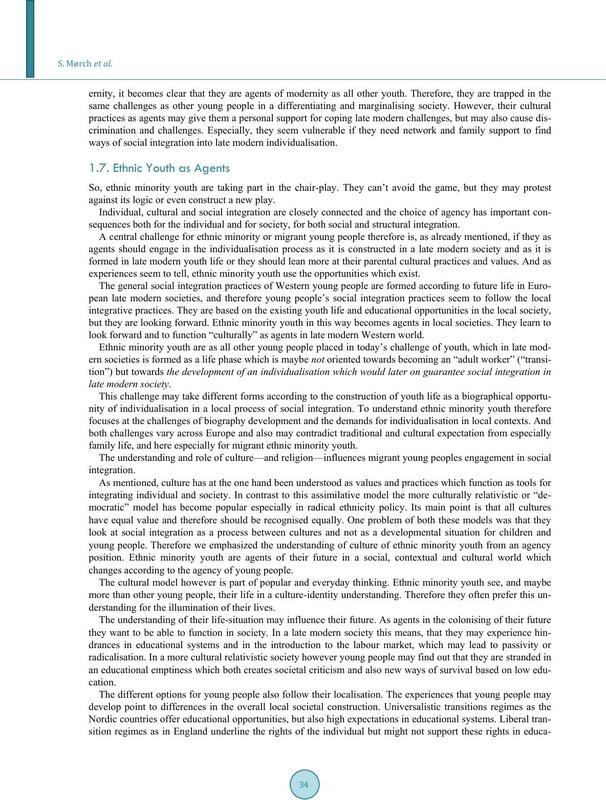 social, contextual and cultural world which changes according to the agency of young people . 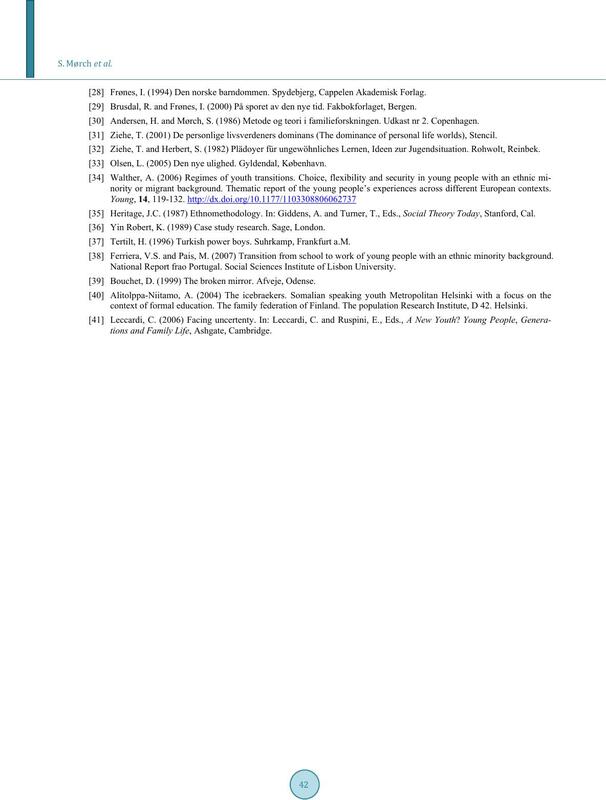 lems and other late modern practices (e.g. in sexual relations) as these are not part of their family upbringing. nority youth it may be difficult to become an agent of late modern youth life. velopment of late modern individualisation competencies, youth life is not o nly about youth lifestyles or cultur e s.
Figure 3. Culture and social integration. wish to combine culture and identity as the subjectiv e so lution to their situ ation. has important consequences both for the individual and for society, for both social and structural integration. or they should lean more on their parental cultural practices and values and seek support in the family. 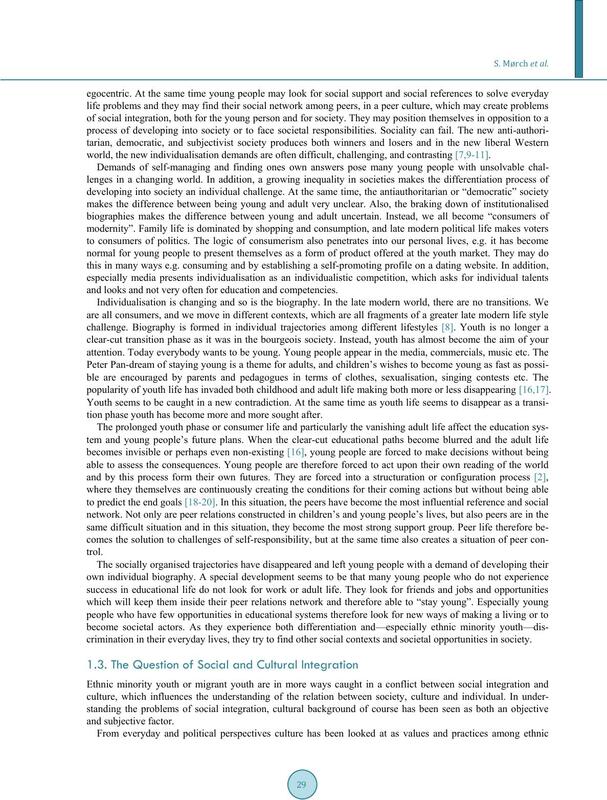 tween categorical social integration and late modern individual social integration. influence to peers, we experience that family background seems most crucial for young people’s development. Family life influences children’s and young people’s educational opportunities . is the basic of social security, and family “honour” is more important than individual—developmental-freedom. youth, and especially among young immigrants whose families come from rural areas. tions may create psychological distress or disturbances for the young people. children and youth should be brought up to be strictly like their parents, or that the children are just adults to be. opmental practices. Some of these potential problems may be most visible during youth. In any way, the supportive family may become an active player in developing late modern individualisation. the life of the modernistic family. The family becomes a supportive network like other sorts of netw or k s .
different aspects of upbringing and family life cooperate seem to become most important. 3) Children or young persons not living with both father and mother. much influenced by family life. on the family’s own social integration. 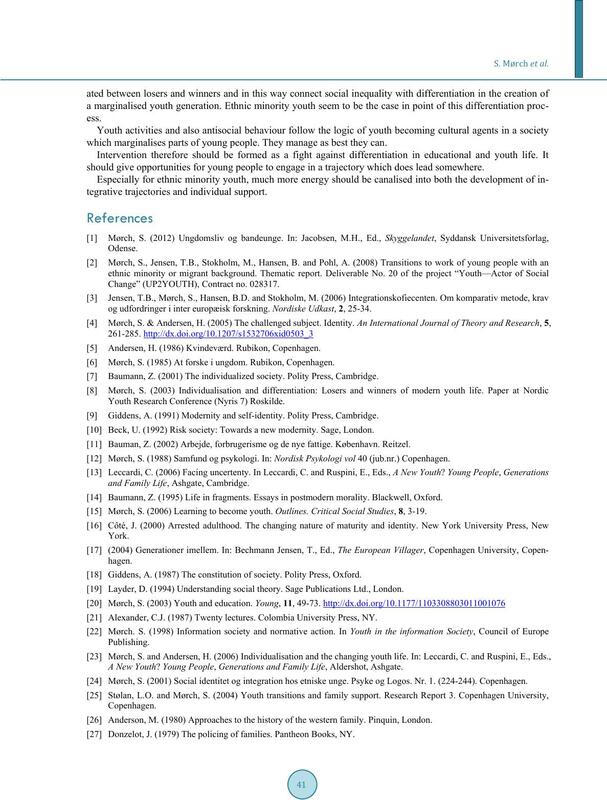 port youth individualisation and the development of youth subjectivity. both securing value and normative support, but also in taking on their new role as counsellors for their children. They may easily support there children’ s cultu ral agency as a very private subjectivity. 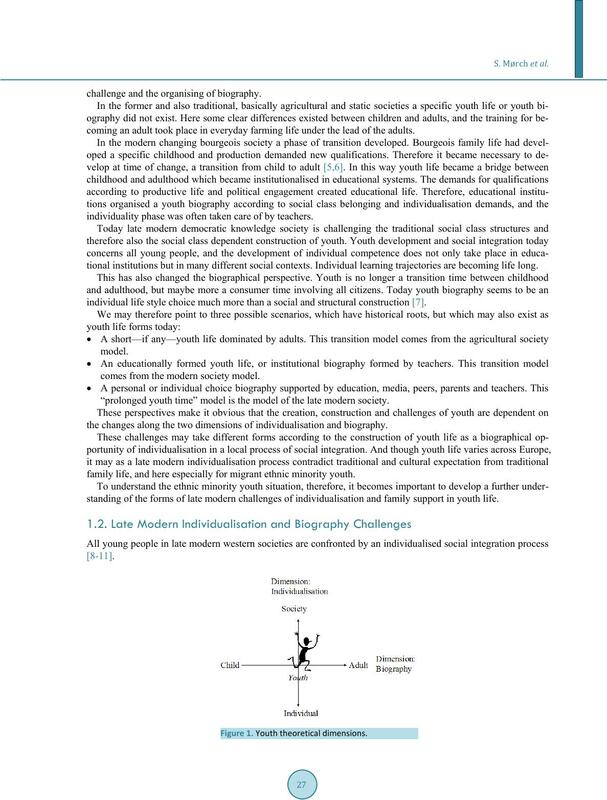 individual biography and therefore new life perspectives among young people. breaking family influence and finding ways into late modern individualisation. ways of social integration into late modern individua lisation. against its logic or even construct a new play. sequences both for the individual and for society, for both social and structural integration. experiences seem to tell, ethnic minority youth use the opportunities which exist. look forward and to functio n “ c ulturall y” as agents in late modern Western world. family life, and here especially for migrant ethnic minor ity youth. changes according to the agency of young people. derstanding for the illumination of their lives. gimes and mostly point to changes in societal logics . for young people to find out why they experience problems in transition from education to labour-market. 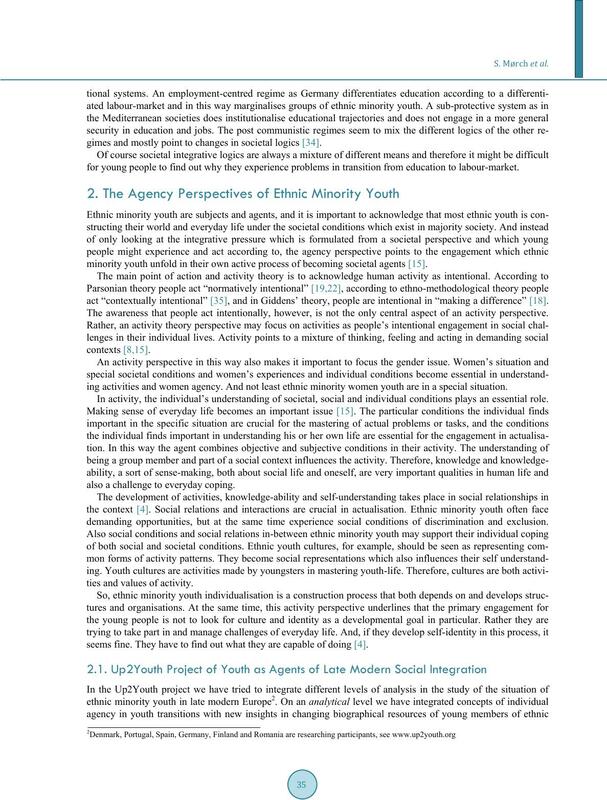 minority youth unfold in their own active process of becoming societal agents . act “con textually intentional” , and in Giddens’ theory, people are intentional in “maki ng a d iffe renc e” . The awareness that people act intentionally, however, is not the only central aspect of an activity perspective. ing activities and women agency. And not least ethnic minority women youth are in a special situation. In activity, the individual’s understanding of societal, social and individual cond itions plays an essential role. also a challenge to everyday coping. demanding opportunities, but at the same time experience social conditions of discrimination and exclusion. ties and values of activity. seems fine. They have to find out what they are capable of doing . by public policies converting inequality structures into cultural and social capital. their ambitions for becoming recognised in every day life and the integrative arenas of school and work. terest in finding ways of analysing contextual knowledge at a more analytical comparative level. 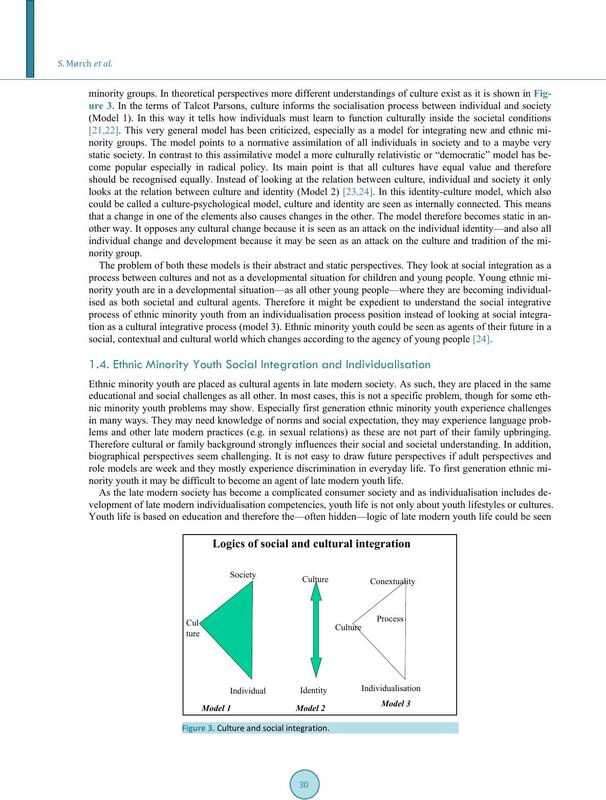 integration as the process of the individual agent. respect we tried to find “critical cases”, as it is argued in Robert K. Yin’s book “Case Study Research” . mation on these levels and issues. The collected cases made up the data material for a qualitative analysis. nic minority youth in Europe. ally and socially in different arenas as well as within the recipient society. 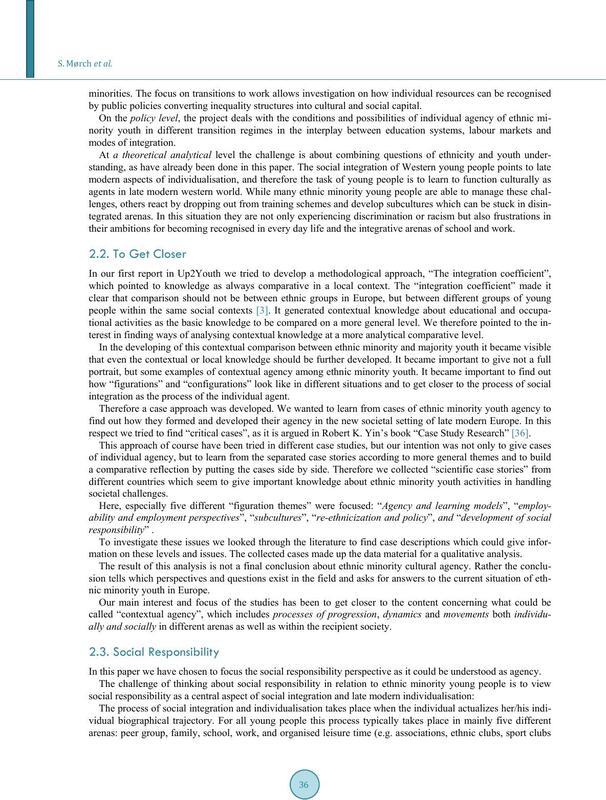 In this paper we have chosen to focus the social responsibility perspective as it could be understood as agency. the individual bi ography in youth li fe c ould be understood as a proce s s o f s t ruc turation . 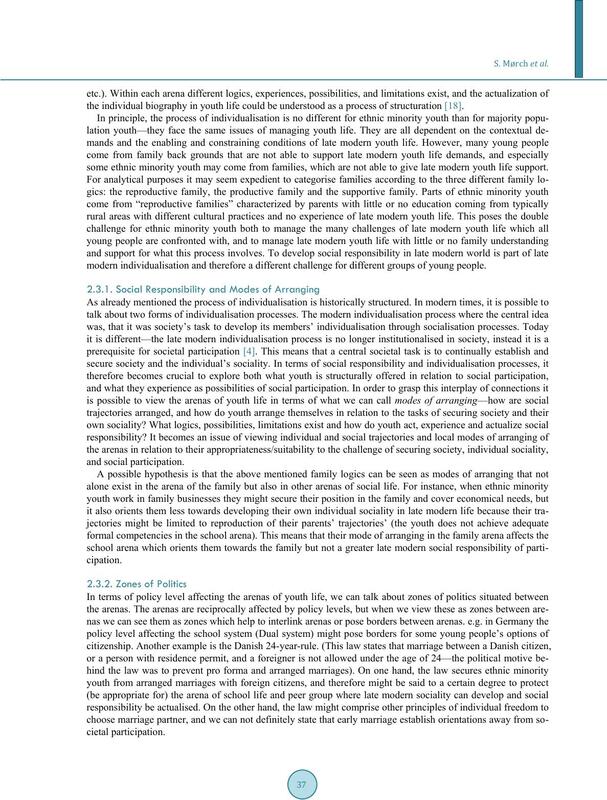 some ethnic minority youth may come from families, which ar e not able to give late modern youth life support. 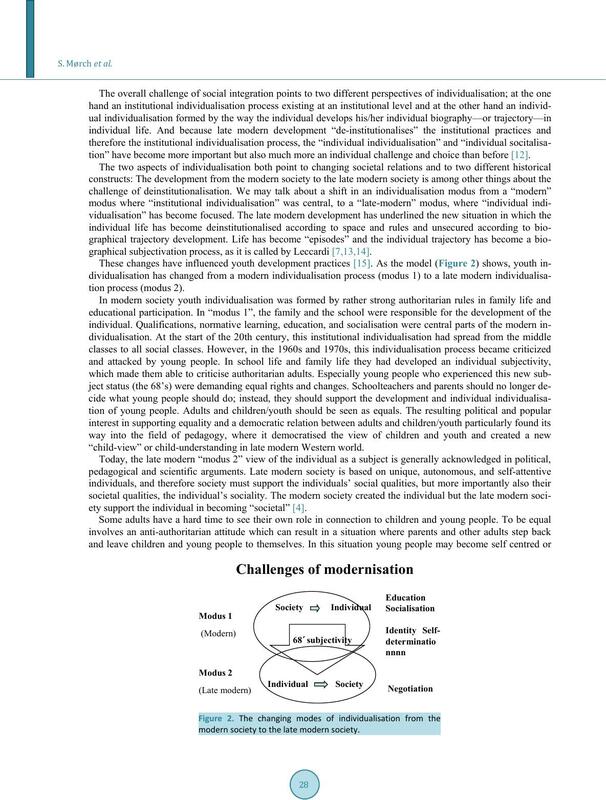 modern individualisation and therefore a different challenge for different groups of young people. clusio n or e xc lusio n? raise new questions whic h will inc re a s e our unders tanding of social responsibility. 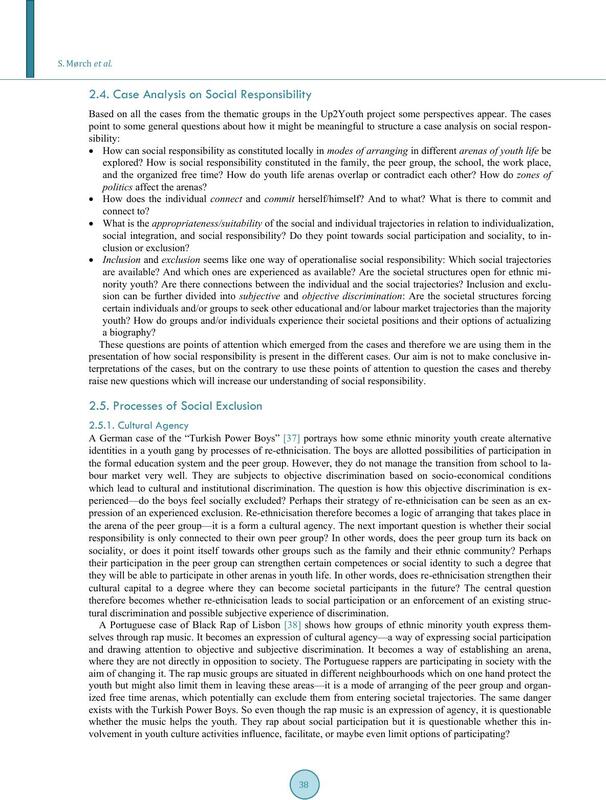 tural discrimination and possible subjective expe rience of di s c rimi na t ion. volvement in youth culture activities influence, f a cilitate, or maybe eve n li mit op tion s of particip a ting? ries—their strategies appear more appropriate for developing into instead of away from society. development among ethnic minority youth relates to both contexts and to exclusive and inclusive experiences. youth life construction at the same time. [14,41]. As described by Baumann, life planning has been changed to episodes which refer to situational options. opment he or she is taking part. but a societal actor. On the other hand, late modern individualisation has also become a more private concern. responsibility has become an important issue. lows the processes of social integration and the processes of social inclusion and exclusion. local perspective on social responsibility. Th ey have to fight for their situation. 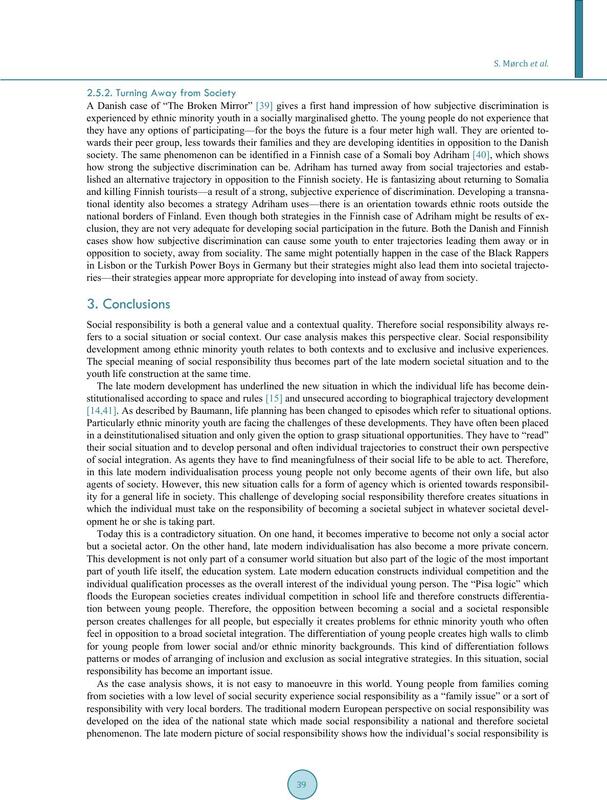 Social responsibility also refers to the broader inclusion/exclusion-perspective which exists in local society. cietal position. They may choose to refrain from engaging in and becoming friends with other young people. If we combi ne the se two dim ensi ons, we m ay draw a m odel of the chall enge of soc ial res ponsibili ty (Figure 4). ranging from societal to a more social and local form of social responsibility. fluence the possibilities of developing forms of soc ial r esp onsibility. Figure 4. 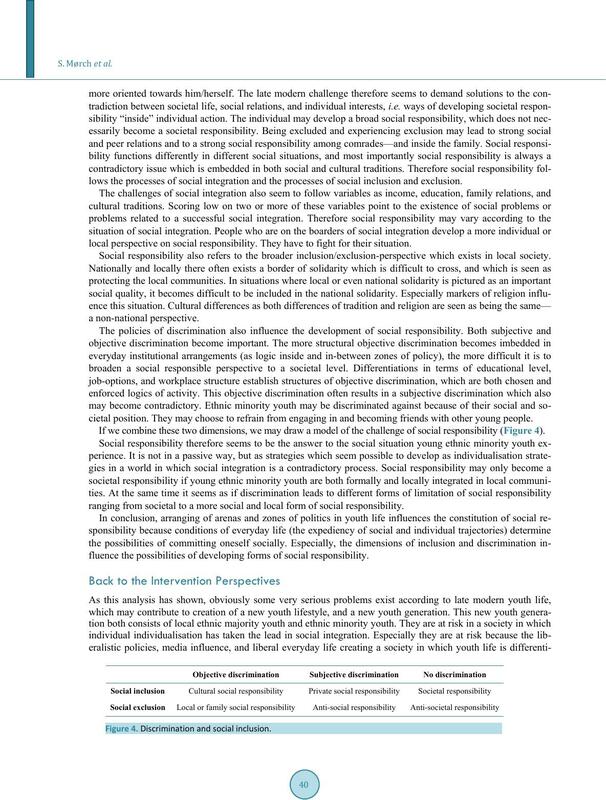 Discrimination and social inclusion. which marginalises parts of young people. They manage as best they can. should gi ve o pportunities for young people to engage in a trajectory which does lead somewhere. tegrative trajectories and individual suppo rt. Change” (UP2YOUTH), Contract no. 028317.
og udfordringer i inter europæisk forskning. Nordiske Udkast, 2, 25-34. Andersen, H. (1986) Kvindeværd. Rubikon, Copenhagen. Mørch, S. (1985) At forske i ungdom. Rubikon, Copenhagen. Baumann, Z. (2001) The individualized society. Poli ty Press, Cambridge. Youth Research Conference (Nyris 7) Roskilde. Giddens, A. (1991) Modernity and self-identity. P ol ity Press, Cambridge. Beck, U. (1992) Risk society: Towards a new modernity. Sage, London. Bauman, Z. (2002) Arbejde, forbrugerisme og de nye fattige. København. Reitzel. Mørch, S. (1988) Samfund og psykologi. In: Nordisk Psykologi vol 40 (jub.nr.) Copenhagen. and Family L ife, Ashgate, Cambridge. Baumann, Z. (1995) Life in fragments. Essays in postmodern morality. Blackwell, Oxford. Mørch, S. (2006) Learning to become youth. Outlines. Critical Social Studies, 8, 3-19. Giddens, A. (1987) The constitution of society. Polity Press, Oxford. Layder, D. (1994) Understanding social theory. Sage Publications Ltd., London. Alexander, C.J. (1987) Twenty lectures. Colombia University Press, NY. A New Youth? Young People, Generations and Family Life, Aldershot, Ashgate. Mørch, S. (2001) Social identitet og integration hos etniske unge. Psyke og Logos. Nr. 1. (224-244). Copenhagen. 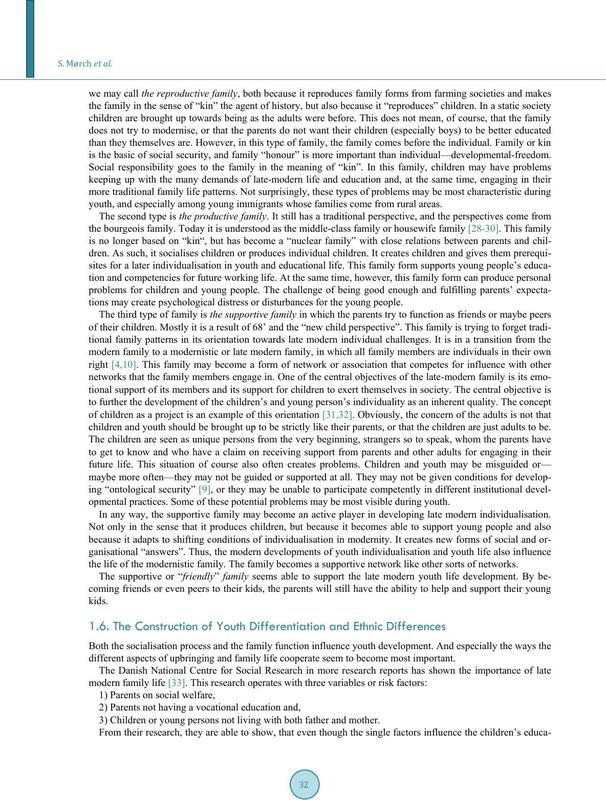 Anderson, M. (1980) Approaches to the history of the western family. Pinquin, London. Donzelot, J. (1979) The policing of families. Pantheon Books, NY. Frønes, I. (1994) Den norske barndommen. Spydebjerg, Cappelen Akademisk Forlag. Brusdal, R. and Frønes, I. (2000) På sporet av den nye tid. Fakbokforlaget, Bergen. Andersen, H. and Mørch, S. (1986) Metode og teori i familieforskningen. Udkast nr 2. Copenhagen. Ziehe, T. (2001) De personlige livsverdeners dominans (The dominance of personal life worlds), Stencil. Ziehe, T. and Herbert, S. (1982) Plädoyer für ungewöhnliches Lernen, Ideen zur Jugendsituation. Rohwolt, Reinbek. Olsen, L. (2005) Den nye ulighed. Gyldendal, København. nority or migrant background. 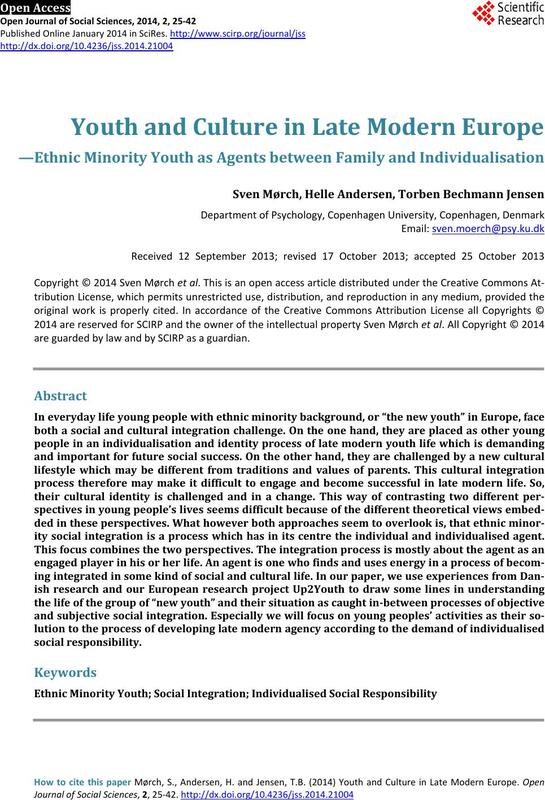 Thematic report of the young people’s experiences across different European contexts. Heritage, J.C. (1987) Ethnomethodology. In: Giddens, A. and Turner, T., Eds., Social Theory Today, Stanford, Cal. Yin Robert, K. (1989) Case study research. Sage, London. Tertilt, H. (1996) Turkish power boys. 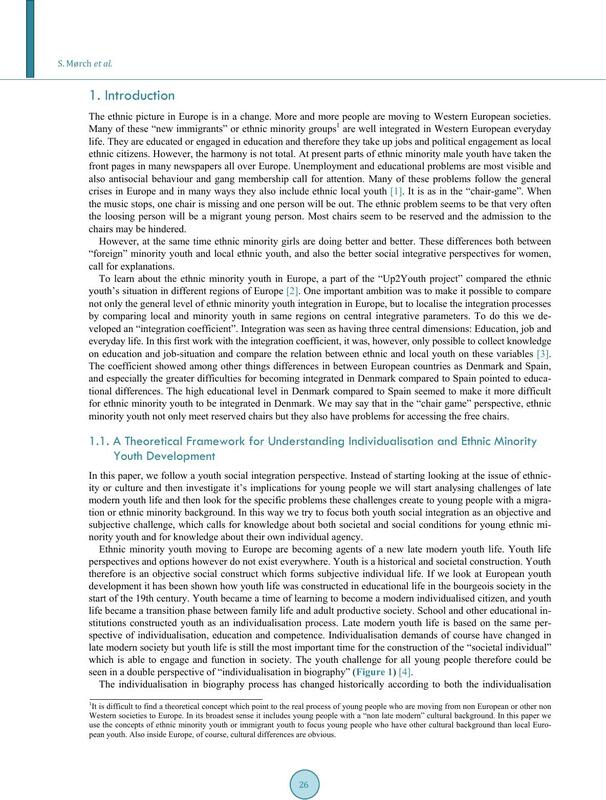 Suhrkamp, Frankfurt a.M.
 Ferriera, V. S. and Pais, M. (2007) Transition from school to work of young people with an ethnic minority background. National Report frao Portugal. Social Sciences Institute of Lisbon University. Bouchet, D. (1999) The broken mirror. Afveje, Odense. context of formal education. The family federation of Finland. The population Research Institute, D 42. Helsinki. tions and Family Life, Ashgate, Cambridge.